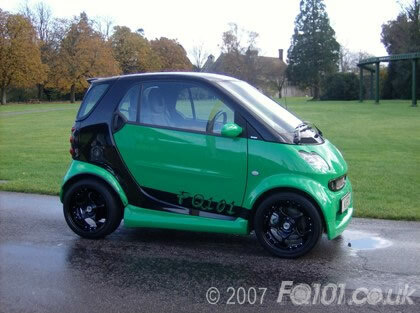 After hearing nothing but talk of Smart cars and seeing the drive full of them for the last three years it got the better of me and I bought one. 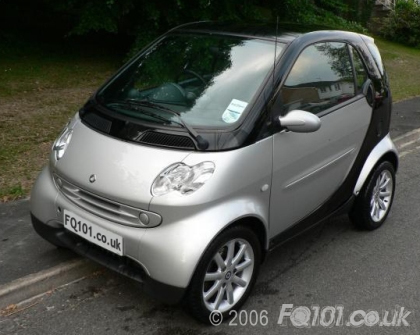 Looking through the Auto Trader for weeks and weeks I found a black and silver 04 Passion Coupe, I fell in love, it was just perfect! That evening Justrules and Racingsnake went to pick the car up. I didn’t even know if they had bought it until I heard a toot outside the gate! It stayed standard for about a week before the modding started. JimmyWong added a LED as my first mod, I knew it was the first of many. I wanted the car to stand out so was thinking of a pink respray. My brother kept on at me to forget about the pink and go for a really bright orange. London to Brighton was coming up and I wanted the car ready so into the spray shop it went with Ford Focus ST orange being the chosen colour. Even while it was being sprayed I didn’t know what would be the end result. The Styleline wheels were being sprayed in gloss black with custom orange FQ101 stickers on each wheel. Everything was fitted to the car the night before L2B so it was a really close call whether or not the car would be ready or not. London to Brighton was my first big event and I have to say I loved ever minute of it and I look forward to many more. After someone drove into the back of me, breaking the panel clips, I decided it was time for a re-vamp. Justrules suggested Porsche GT3RS green but I was not convinced, until i saw it! 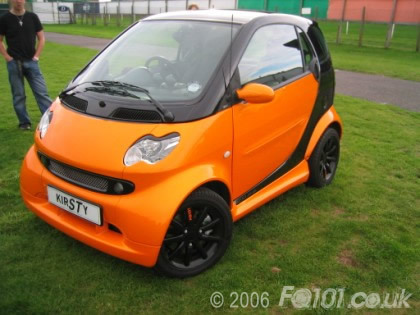 I loved the colour and booked my car in right away! A few days later the panels were done and I got my Schmidt wheels resprayed leaving the studs silver. We had a time limit again, i wanted my car ready for Beaulieu 2007. Although we were cutting it short, it was ready in time. We had a great day at Beaulieu and after winning 'Cutest Car' and 'Best Car in Show', all the hard work paid off. I'm really chuffed with the result.